The story began when a good friend—who also writes children’s books—and I were discussing themes in books. We challenged one another to write a story with the theme of everlasting love. I thought about the idea a great deal, wondering what eternal love would mean to a young child. 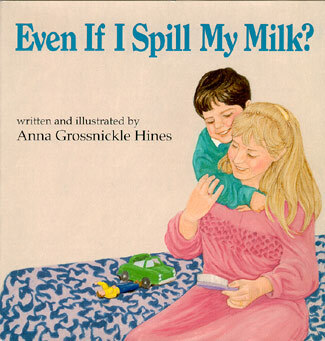 That was the beginning of Even If I Spill My Milk? If mother is going out when the child wants her to stay home, does that mean she doesnt love him? And if he does things he knows she wont like, will she still love him? I could hear the conversation in my head. As a motherand as a childId participated in similar conversations myself. I could hear the words quite clearly between the two of them. What they said gave enough hints that I could picture the actions and setting as well: in the kitchen pouring milk, the bathroom brushing teeth, getting everything just right before crawling reluctantly into bed. I wrote, revised, made a rough dummy and submitted the story. My editor, Jim Giblin, liked the idea but felt it would be stronger if Daddy were present as well. I hesitated, thinking it might be good to leave that ambiguousMama could be meeting Daddy, or seeing a movie with a friend while Daddy is working, or she might be a single parent. But Jim convinced me that leaving the situation ambiguous raised the question of jealousy...not a bad concern to address in a picture book...but not the one I had chosen for myself. So where is Daddy and what is he doing and how could I bring him in without interrupting the conversation with a lot of he saids and she saids? How could I make him a caring active participant without involving him in the conversation? My solution was to put him in the pictures...busy greeting and giving directions to the baby-sitter, and helping to pick up, and saying good-night with a kiss. The illustrations were first drawn with a pencil line, colored with felt water-color markers, except for the carpet where I wanted the texture of the white paper showing through, and then colored with Prismacolors. Since my youngest daughter Lassen, age thirteen when I was working on this book, was already as tall as I was I had to go looking for a model. Three year old Timothy, who I sometimes see playing with his brother and sister as I look from my studio window across a creek into his back yard, agreed to let me take pictures of him. He got dressed and undressed, brushed his teeth, crawled under and out from under his bed...somewhat perplexed as to what it was all about until he saw the drawings in progress. I think he just may help me out again sometime. And Lassen got to pose as the baby-sitter. I just made her a little bit shorter than she really is. I also had to do a little altering on my husband Gary who played the role of Daddy. Can you tell what? Kirkus Reviews , March 15, 1994 Copyright ©1994, Kirkus Associates, LP. All rights reserved. In an appropriately small, cozy, square picture book, Jamie, who doesn't want his parents to leave him with a sitter while they go to a party, wins an extra five minutes with his mother. As Jamie and Mama go through their getting-ready-for-bed rituals, Mama reassures Jamie of her constant love. The pictures and text depict patient, responsible parents, and the story is comforting and realistic, if a bit purposeful. Horn Book Copyright © 1994 The Horn Book, Inc. All rights reserved.